The idea of forming a community of retired Anglican clergy began in the mind of Canon William Cooper around 1890. While visiting on the south coast, he and a friend discovered dozens of retired priests, without any income, living in Workhouses. He determined to do something, and set about the task of founding a new community, of which he was to become the first Warden. 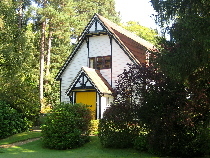 It was several years before Cooper secured agreement to rent a house in Dormans Park, Surrey, and the first resident was admitted in 1895. As the number of Residents increased another house was rented and “The Homes of St Barnabas” were born. The time had come for a permanent home for the community. 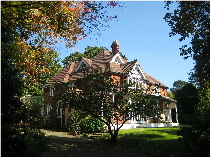 Cooper set about raising the funds to realise his vision, and, after substantial contributions were pledged, the present estate of some nine acres was purchased. He chose the site partly because of its mild climate and beautiful surroundings and partly because it is adjacent to Dormans Station and so within easy reach of London. The foundation stone of the present building was laid in July 1900 and the West wing and administrative block were opened the following year. Over time the buildings continued to be developed with the addition of the East wing and an extension to the Chapel. By 1977 it was accepted that the original name was inadequate. It did not reflect the collegiate nature of the community’s lifestyle, neither did it do justice to the study in which many of the Residents continued to be engaged. So it was that the name was changed to become “The College of St Barnabas”. Since then, the development of the College has seen the substantial upgrading of the Nursing Wing from a ward to individual private rooms, the Cloisters to include en suite facilities, and the addition of further rooms for residential care. Most recently the Refectory and Common Room have been refurbished, and state-of-the-art DVD, sound and video projection facilities have been installed. The College is now furnished with modern amenities such as broadband internet connections in Residents’ rooms, and yet, in the second century of its life, retains a feeling of history and the beautiful surroundings which encouraged its founders to build here.To read more about the life of the College and the facilities we offer, go to our home page.